I love to read, it is one of my favourite things to do in the whole world. I have hundreds of books, much to my husband’s annoyance; I love to buy books too. Some girls it shoes and handbags, mine is books I love nothing more. Don’t get me wrong I still love shoes and handbags but books come first. When my little boy was born, I bought loads of books to read to him. I love reading to him, even if he doesn’t pay as much attention as I would like. My favourite time of the day is reading to him at bedtime; however, he does not really want to listen to the stories I want to read to him. But I’ll wear him down. He’s always wanting Meg and Mog, which I do like but not after the twentieth consecutive night of the same story. He also loves In the Night Garden books just now, not my cuppa tea but who am I to judge. When Muller Little Star Yoghurt’s were doing their offer of Ladybird books we got The Three Little Pigs. Now I loved this book as a child, so I thought my little one would like it too. I was so excited to sit down and read it to him that night. We snuggled up on his toddler bed and I started read. However, it wasn’t the nice story about the three pigs that defeated the bully wolf and lived happily ever after that I remembered. This was a story that would give me nightmares never mind my little ones. 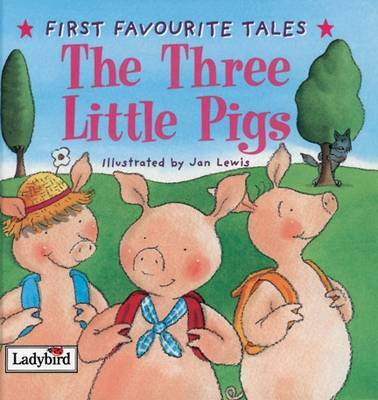 In this version, the mummy pig sends her three babies out into the big bad world with nothing more than a packed lunch. See ya later, I’m off to party is what I heard. Bla bla bla… First pig builds house with straw, wolves blows it down and then eats him. Really!!! Eats the pig, when did this happen? Bla bla bla…Second pig builds house of stick, wolf blows it down and then eats him. Really!!! Eats him again, how much bacon does one skinny wolf need. Bla bla bla… Third pig builds a house of bricks, wolf tries to blow it down but he can’t. He’s full of hot air but not that much. So the pig put a big pot of boiling water on the stove, it’s one of the old fashioned ones where they cook on the fire. Pretty quick builder this pig had. Therefore, the wolf climbs in the chimney, and well its wolf soup all round. Now do you want your children listening to a story about Peppa and George’s cousins being eaten? In addition, the wolf like the one in Super Why, it has been made into soup and eaten. What is the moral of this story? You eat my brothers and I eat you? I’m all for defeating the bully, but eating him? What do you think about reading these types of stories to your children; do you try to sugar coat them? Or do you read these the way they are? If you do how do you explain the eating of the animals? This is a brilliant example, but many of the stories that we were read as children are in hindsight extremely creepy.I remember when I was about five or six my mum read me The Little Mermaid. I saw the picture of the evil Ursula and I couldn't sleep for weeks without the light on.I read 'happy' stories to my little man. I generally have to screen them too in case there's a hidden meaning; I read one recently where 'grandma went to hospital and didn't come home'. Made the mistake of judging a book by it's cover, though it was about a robot :-)! We possess – literally – 4 versions of the three little pigs, all of which have slightly different variations/endings. My two love all of them, and they don't seem too bothered at all that a) they are different, and b) some of them end in a pretty gruesome fashion.Personally I've always loved the one where the pig eats the wolf. I don't think there's any harm in reading stories like that to children, as long as you take into account their age/preferences. It's certainly a good discussion point! I just read it to them, they are OK about animals eating aminals ect it is life. We eat pigs! FIL is a farmer, can not escape nature! I big and am I bad and I am bad and I am big and I am going to eat me a little pig!